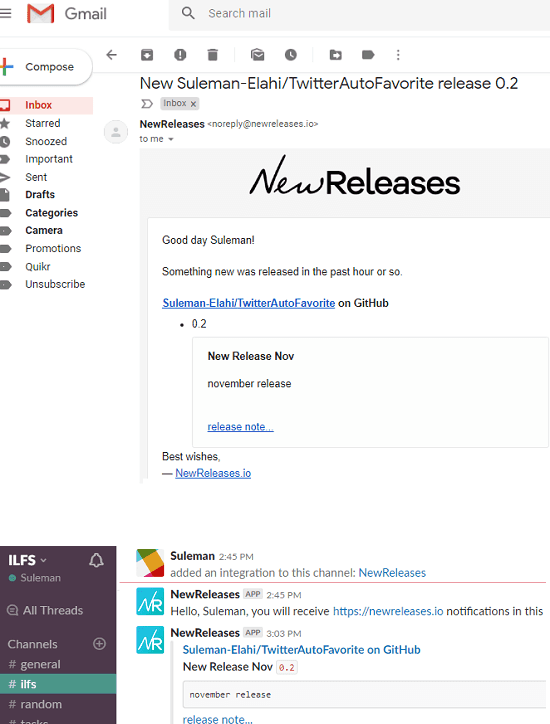 NewReleases.io is a free website to get email alerts for new releases from GitHub, GitLab, PyPI, Ruby Gems. And not only this, apart from these, it supports BitBucket, Docker Hub, Node.js NPM, and PHP Packagist. You just have to give it a URL of a package whose release you want to watch. And it lets you set daily or hourly monitors to watch new releases. When a new release becomes available, it notifies you by sending an email alert. Not only this, but it can push Slack notifications as well. You’ll just have to authorize your Slack account in it. If you want to get notifications about new releases about your favorite repository then you can use this tool. Also, it works with other sites to track the newly updated packages of different programming languages. Generally, those websites don’t provide you an option for email alerts but if you use this tool, NewReleases.io then you can easily achieve that. You just have to submit the URL of the repo or package that you want to track and set the monitoring intervals. 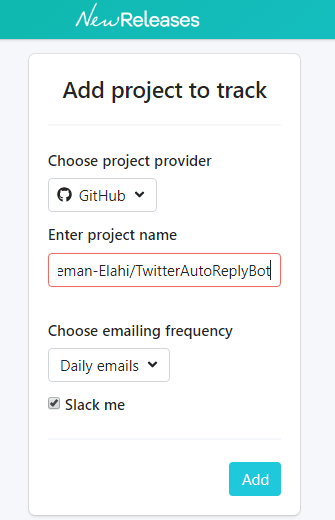 How to get Get Email Alerts for New Releases from GitHub, GitLab, PyPI, Ruby Gems? Using this website to get alerts about new releases is very simple. Create a free account on homepage of NewReleases.io and then simply verify it. After that, you can start configuring the notifications for getting alerts. So, simply choose the website from which you want to get alerts for new releases. After that, specify the URL of the package or repository. You can also specify the intervals to check for new release. You can either opt to check for a new release daily or hourly. 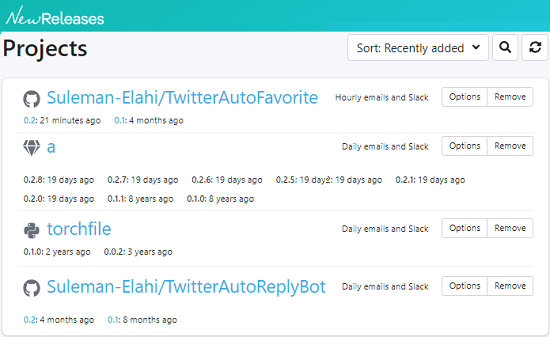 By default, it will send you Slack and email notifications both. But if you want only one then you can do that. As a new release becomes available, it will send you an email alert. You can see the screenshot below. In the alert, you will see the name and version of the newly released package. You can use this simple online tool in this way every time you want to track new releases or a package. It is very good tool for programmers and to see new release from popular libraries and packages. There are some tools to get notifications for new GitHub releases but here this tool, NewReleases.io is a bit advanced one. You can use it to get alerts from PyPI and NPM like websites too. It is really a very nice tool for programmers and if you are in need of such tool then you can start using right away.